I don't know if this spot merits inclusion in the guide, but I want to recommend the Ebey Waterfront Trail in Marysville. This asphalt trail along Ebey Slough and bordering the Marysville Sewage Treatment Lagoon, opened in 2017. It's part of the project to restore the Qwuloolt Estuary by breaching part of the dike along Ebey Slough. The trail is a little over 3 miles round trip. We saw close to 40 species in early December, including Bonaparte's Gull and a variety of ducks from Ruddies to Lesser Scaup. It's also a pleasant walk. Take the Marysville exit off I-5 (Exit 199) and proceed a few blocks east and a few blocks south to Ebey Waterfront Park, where you'll find parking and bathrooms. The trail takes off eastward from here. Hi Carolyn - I think Lake Forest Park probably belongs in the Seattle and Vicinity section of the book, but I'll go ahead and respond here. My understanding is that Northern Bobwhites have been raised or released at various times and places around the state by or for hunters and thus have been found at a wide variety of locations from time to time. They don't usually persist, however. They cannot be considered to have a "range" in Washington State. The only known place they've established themselves in the state that I'm aware of is on Fort Lewis prairie, and, even there, they are hard to find. We have a Northern Bobwhite in our backyard in the Lake Forest Park area. Is this bird out of its range? 5/26/2018 I'm not a birder -- In the past couple years when possible I've been paying attention and trying to look up birds in books and online. Today in downtown Everett on Hoyt a flock of black birds stopped by. They have the most distinctive song I think I've ever heard. I've looked through all the Pacific Northwest birds on Audobon.org and didn't see an exact match, though I only saw them at some distance against a bright sky. I tried listening to the songs there of all the thrushes and many other birds and didn't find it. I'm pretty sure they are mostly black, shaped kind of like a flycatcher and smallish -- passerine, I'm pretty sure. They were hanging out in the trees and rooftops. Sometimes the call is a long piercing downward swooped whistle and sometimes it's like a long string of clicks. And there's a third and maybe fourth call as well. The calls aren't combined, so I wondered whether 3-4 brand new species descended on us all at once. They hund around for a couple hours and were gone, I think. I'd never heard it before and it just blew me away. If anyone can suggest a bird it might be, please let me know at mmagnus@trismegistos.com. Black Swifts appear to be nesting at Snoqualmie Falls. Up to half a dozen individuals at a time have been observed in June-July in recent years, flying above and around the falls between sunset and nightfall –– presumably adults returning to their nests. They are not guaranteed on any given day, and even when they are present they rarely offer fully satisfying views. A word of caution: Vaux's Swifts are not uncommon in this same vicinity. From the Chinook Bend parking area, there had been a trail that crossed the creek then headed northwest to the river. This is a great spot to view Bank Swallows and their colony on the west side of the river and a lot closer than the long walk through the Stillwater area. Had been because a beaver dam has flooded the crossing and standing water in the stand of small conifers makes it impossible to access the river without waders. Instead, head southeast along the trail and find a way to cut through the trees to the north then back to the northwest for another access point. Field's Riffle Park, just west of Snohomish on the Lowell River Road, is an undeveloped property owned by the park service. It consists of open grasslands and wooded areas along the river bank. The grassy portion is a great spot for common yellowthroats, and lazuli buntings nest there in summer. Also see eagles, swallows, rufous and Anna's hummingbirds, cedar waxwings, northern flickers, marsh wrens, and downy and hairy woodpeckers. This is an undeveloped area, so there are no amenities. Parking is limited to 3-4 cars in a turnout off Lowell River Road in front of the gated gravel path leading back into the property. At the end of the last ice age, impounded waters burst from a glacial lake east of the present site of North Bend, scouring out a lowland valley extending some 40 miles to Puget Sound. Today, three forks of the Snoqualmie River come down from the Cascades to unite at the head of this valley. After plunging over Snoqualmie Falls a few miles downstream, the river meanders across a broad floodplain with ancient oxbows, ponds, marshes, wet meadows, and patches of woods. The Tolt River flows in from the east at Carnation, and the Skykomish joins the Snoqualmie near Monroe to form the Snohomish, with its estuary 15 miles farther on at Everett. Converted to farmland by early settlers, the valley has largely preserved its bucolic character despite intense development pressures. From foothills to tidelands, this riverine ecosystem offers the best all-round birding in the Seattle/Everett metropolitan area. The route described below follows the river closely, with a representative selection of good birding spots. However, the enterprising will find the same birds practically anyplace in the valley where there is a bit of habitat. Those inclined to leave their cars will enjoy walking or biking along the Snoqualmie Valley Trail, an abandoned rail road grade between Cedar Falls and Duvall that provides many birding opportunities. For the most part the birds mentioned are those that can be found in migration or the breeding season. Winter birding out in open country is also excellent, although access is regularly disrupted by flooding, and dense morning fog does enshroud the Snohomish Flats occasionally. Look for raptors perched or hunting—a Golden Eagle or a Gyrfalcon is not an impossibility. Be on the alert for unusual species in winter sparrow flocks along brushy ditches and fencerows, blackberry tangles, and thicket edges. American Tree, Clay-colored, Swamp, White-throated, and Harris’s Sparrows are possible among the numerous Spotted Towhees, Fox, Song, Lincoln’s, White-crowned, and Golden-crowned Sparrows, and Dark-eyed Juncos. Windbreaks and pine plantations may harbor roosting owls. In wooded tracts, foraging flocks in conifers or among bare branches may include Downy Woodpecker, Hutton’s Vireo, and Yellow-rumped or Townsend’s Warblers along with Black-capped and Chestnut-backed Chickadees, Bushtit, Red-breasted Nuthatch, Brown Creeper, Bewick’s Wren, Golden-crowned and Ruby-crowned Kinglets, and various finches. Pacific Wrens frequent the understory, and now and then you may pick up the call-note of a skulking Hermit Thrush. 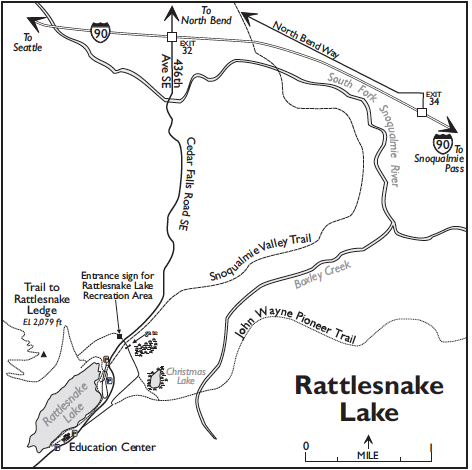 The itinerary begins at the foot of the Cascades at Rattlesnake Lake, southeast of North Bend at an elevation of 900 feet. From I-90, go south at Exit 32 on 436th Avenue SE, which crosses the South Fork Snoqualmie River and changes name to Cedar Falls Road SE, arriving in 2.7 miles at the sign for the Rattlesnake Lake Recreation Area. (Despite the name, there are no rattlesnakes in Western Washington.) The first of several parking lots is 0.2 mile ahead, on the right (toilets here and elsewhere). Ospreys patrol the lake in summer; Western Screech-Owls and Barred Owls nest in the surroundings. The John Wayne Pioneer Trail climbs across the Cascades from here to Eastern Washington, following the old Milwaukee Road railway grade (Discover Pass required in designated parking lots). Local trails lead along the lakeshore and through the woods to Rattlesnake Ledge, with a fine overlook. Conifer-forest specialties on the way up may include Hairy Woodpecker, Varied Thrush, and Townsend’s Warbler. Peregrine Falcons have nested on the rock face. The principal source of Seattle’s drinking water, the 141-square-mile watershed is managed as an ecological reserve, closed to the public. Common Loons—rare breeders in Washington—nest on the reservoir, but except for tours (inquire at the Education Center) you are limited to exploring the watershed around the edges. For one productive spot, go back to the recreation area sign, turn right (east) onto an unmarked gravel road, and continue straight about 150 yards to a closed gate. Park out of the way and walk around the gate. In 50 yards, turn off left and follow a track through mixed forest, primarily big old Red Alders with some second-growth conifers and Black Cottonwoods, with a large wetland on your left. In about a quarter-mile stay right where the track forks and continue a short distance to Christmas Lake,a shallow lake with much emergent vegetation and drowned-out snags where Tree Swallows nest. Woods and shoreline offer a fine selection of birds of the Westside lowlands in migration and summer, including Band-tailed Pigeon, Vaux’s Swift, Rufous Hummingbird, Red-breasted Sapsucker, Pileated Woodpecker, Western Wood-Pewee, Willow, Hammond’s, and Pacific-slope Flycatchers, Hutton’s and Warbling Vireos, Steller’s Jay, Red-breasted Nuthatch, Pacific Wren, Swainson’s Thrush, Cedar Waxwing, Common Yellowthroat, Yellow, Black-throated Gray, and Wilson’s Warblers, Spotted Towhee, Song Sparrow, Dark-eyed Junco, Black-headed Grosbeak, Purple Finch, and Evening Grosbeak. King County’s Three Forks Natural Area is a discontinuous, 2.5-mile string of parcels along the Snoqualmie River and its forks between North Bend and Snoqualmie. 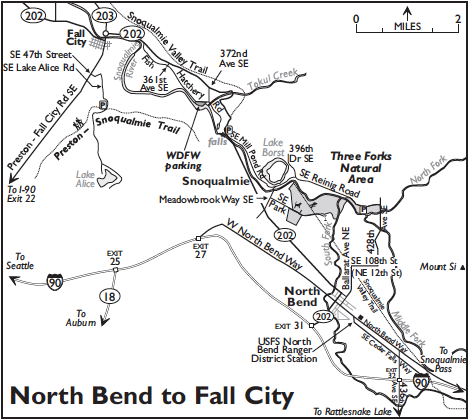 From I-90 Exit 31, take SR-202 north 0.6 mile to a traffic light in the center of the North Bend business district. Turn right here onto North Bend Way, then left in two blocks (0.1 mile) onto Ballarat Avenue NE. Stay on this main road as it changes name and turns right (0.6 mile) toward Mount Si, then left (0.5 mile) in a rural setting where it becomes 428th Avenue SE. The road soon crosses the Middle and North Fork Snoqualmie Rivers a few hundred yards apart. In 1.4 miles turn left (west) onto SE Reinig Road. Parking for the natural area is immediately on the left (seasonal toilet; if gate is closed in winter, park across the road in a small pullout). From here you may walk a short distance to the foot of the North Fork bridge, or take a wide trail to the right through broadleaf and mixed forest, reaching the river in about a quarter-mile. A pullout 0.2 farther west on the left side of Reinig Road offers quicker access to the best birding habitat, but parking is limited. Take the trail through gallery forest and willow thickets to the union of North and Middle Forks; the South Fork flows in half a mile downstream. Red-eyed Vireo, locally distributed in Washington and a Snoqualmie Valley specialty, can be found in mature riparian vegetation here and elsewhere along the river, along with several other nesting passerines such as Pacific-slope Flycatcher, Swainson’s Thrush, and Black-throated Gray Warbler. Walk the broad cobble margins looking for swallows and swifts overhead, Spotted Sandpiper on gravel bars, Green Heron in overhanging streamside branches, and Common Merganser on the river. Continue driving west beside the river on Reinig Road. At the stop sign in 1.5 miles, where 396th Drive SE comes in from the right, bear left with Reinig Road and at the fork in 0.3 mile stay left onto Meadowbrook Way SE, crossing the Snoqualmie River bridge. In 0.2 mile, go left onto SE Park Street. Turn left at the entrance to the Three Forks Off-Leash Dog Area (0.3 mile; additional parking and restrooms available across the road at Centennial Fields Park). Walk through the double gates into the dog-exercise area, a fenced lawn bordered by trees and brush. Walk right, birding the edge habitat, reaching a gate and the Snoqualmie Valley Trail at the far end. Cross over the trail into another piece of the Three Forks Natural Area. A large, open willow and shrub-lined field occupies most of the acreage between the trail and the river, together with stands of tall cottonwoods, with Mount Si as a backdrop. The field can be difficult to walk, even when freshly cut; a well-trodden trail on the left is the most practical route to the back, but walking the edge on the right side of the field can be productive. Expected breeding species include Rufous Hummingbird, Red-breasted Sapsucker, Western Wood-Pewee, Willow Fly-catcher, Warbling and Red-eyed Vireos, Cedar Waxwing, Common Yellowthroat, Yellow Warbler, Savannah Sparrow, Black-headed Grosbeak, and American Goldfinch. Lazuli Bunting is found regularly although not annually (Indigo Bunting in 2009). For an interesting, only barely longer return route, walk left (south) on the Snoqualmie Valley Trail through broadleaf forest with a wide slough on the right, emerging at the entrance to Mount Si Golf Course (public). Exit right onto SE Park Street. The right shoulder affords close views of the tops of riparian willows and associated birdlife along the slough on the way back to the dog-area parking entrance. Return to Meadowbrook Road, turn left, go 0.5 mile, passing Mt. Si High School, to the intersection with SR-202 (Railroad Avenue). Turn right, and in 1.8 miles find the visitor center for 272-foot-high Snoqualmie Falls, a popular day-trip destination for residents of Pugetopolis. The falls in full flow are a spectacular sensory experience, but if water is being diverted for power generation, they can be reduced to a trickle. Peregrine Falcons nest beside the falls on rock ledges. Continue along SR-202 and turn left onto 372nd Avenue SE (1.4 miles). In 0.2 mile, turn right onto SE Fish Hatchery Road, then immediately left into the WDFW parking lot (Discover Pass required). Scramble down the short trail to the Snoqualmie River where it emerges from the gorge below the falls; Tokul Creek flows into the river just upstream on the left (also viewable from the creek bridge by walking back along Fish Hatchery Road from the parking lot). This is a good place to find American Dipper. Continue downriver along Fish Hatchery Road, pulling off frequently to bird streamside trees, open fields, and scattered wetlands. Black and Vaux’s Swifts can sometimes be seen overhead. In 0.6 mile, an oxbow on the right supports an extensive marsh, home to Hooded Merganser, Virginia Rail, Wilson’s Snipe, and Marsh Wren. Continue ahead to 361st Avenue SE (0.3 mile) and turn right to rejoin SR-202 in 0.1 mile. Turn left here to the traffic circle north of the Snoqualmie River and Fall City (1.6 miles). Follow SR-202 around the traffic circle, exiting across the bridge. Do not turn right with SR-202 (0.1 mile), but instead swing left onto Preston-Fall City Road SE. In 0.6 mile, turn left (east) onto SE 47th Street, which in 0.2 mile bends south and becomes SE Lake Alice Road. In another 0.6 mile, turn right into a parking lot (portable toilet) where the road intersects the Preston-Snoqualmie Trail, a former railroad grade. Park and cross back over the road. The wide, blacktopped, non-motorized, barrier-free trail goes east along a wooded hillside, ending in about two miles at an overlook high above Snoqualmie Falls. On an early morning in June the trees are alive with songbirds. A Pileated Woodpecker may surprise you, or even a Barred Owl. From the bridge in Fall City, drive west on SR-202, the Fall City-Redmond Road to a junction with 324th Avenue NE (1.0 mile). Turn right and follow the paved road down the broad, flat valley as it jogs and changes names several times, eventually turning north and becoming West Snoqualmie River Road NE. Breeding species of this open landscape include Savannah and White-crowned Sparrows, Red-winged and Brewer’s Blackbirds, House Finch, and American Goldfinch. In winter scan the sodden fields for ducks and other waterfowl, American Pipit, Western Meadowlark, and perhaps Northern Shrike. Check brushy patches for winter sparrow flocks. Continue to a turnout on the left (4.0 miles from SR-202). Here an overgrown trail gives access to one corner of the Carnation Marsh Natural Area, an unimproved tract extending northward for over a mile. This former river course is impenetrably vegetated and mostly flooded (with help from Beavers), and the road shoulders are narrow, so park at this spot and bird along the road on foot. Close to 100 species have been recorded in the breeding season, including 10 species of ducks, Ruffed Grouse, American Bittern, Osprey, Virginia Rail, Wilson’s Snipe, five species of woodpeckers (Redbreasted Sapsucker, Downy, Hairy, Northern Flicker, Pileated), Olive-sided, Willow, and Pacific-slope Flycatchers, four species of vireos, six of swallows, Marsh Wren, and most of the other Puget Lowlands songbird species. Continue driving north to the intersection with NE Tolt Hill Road in 1.7 miles and turn right (east) onto a bridge over the Snoqualmie River. In 0.6 mile turn left again at the junction with Fall City-Carnation Road (SR-203), and drive north across the Tolt River into the town of Carnation. The main entrance to Tolt River-John MacDonald Park is reached by turning left onto NE 40th Street (0.5 mile). Go straight in to the parking lots (toilets, picnic shelters). You can walk south through the campground to the Tolt River at the point where it joins the Snoqualmie, birding the tall riparian trees, but the best birding is on the west bank of the Snoqualmie, reached by a suspension footbridge. This area of diverse habitats (forest, grasslands, brushy edges, riparian) is served by an extensive trail system. Expect almost any Western Washington lowland species including Hammond’s and Pacific-slope Flycatchers, Cassin’s, Hutton’s, Warbling, and Red-eyed Vireos, Steller’s Jay, Black-capped and Chestnut-backed Chickadees, Orange-crowned, MacGillivray’s, Black-throated Gray, and Wilson’s Warblers, Western Tanager, Black-headed Grosbeak, and Bullock’s Oriole. As elsewhere along the Snoqualmie, swifts often forage overhead. Belted Kingfisher and many swallows can be seen from the bridge. Return to SR-203. Turn left (north). In 3.3 miles, about 300 yards past the Stillwater store, turn left into the Stillwater Unit of the Snoqualmie Wildlife Area and park (Discover Pass required here and at a second parking area 0.7 mile farther north). Bordered on the northeast by the highway and on the southwest by the river, this section of the Snoqualmie floodplain extends about a mile and a half as the river flows and three-quarters of a mile across. It is managed for hunting, with numerous open fields where grain crops are left to ripen for feed, framed by ditches, dikes, and sloughs. Maples, cottonwoods, alders, and willows flourish along watercourses; blackberries and other dense brush provide winter sparrow cover along field borders; cattails and sedges dominate the marshy places. Birds typical of these habitats can be found readily in the appropriate seasons. Avoid the area during the hunting season (September to January with some variation—the current year’s regulations are usually posted at the parking lots). In the non-hunting months of the year you may wander the area freely. The Snoqualmie Valley Trail passes the back side of both parking lots. A good cross-section of habitats can be sampled by walking right (northwest) along the trail from the south parking lot. A marshy pond between trail and highway has herons and other waterbirds. In about 400 yards, a service road descends the embankment on your left. Follow this road toward the southwest. It turns left along a dike, right to follow a slough, left across the slough, then right again toward the river. A pair or two of Lazuli Buntings have nested here some years. At the back of the last field turn right when you reach a row of tall trees, then bear left across a grassy stretch to the high river bank, home to a colony of Northern Rough-winged and Bank Swallows. Walking south along the trail from the south parking lot for a half-mile or so, to the second of two bridges, takes you through fine riparian and wetland habitat. The elevated trail embankment provides exceptional access and viewing for common breeding species such as Red-breasted Sapsucker, Willow Flycatcher, Swainson’s Thrush, and Common Yellowthroat. American Bittern is also here, although difficult to see. Yellow-breasted Chat has been recorded. 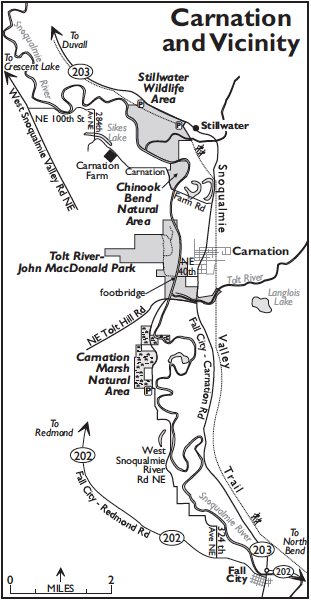 Return to your car and head back toward Carnation. In 1.9 miles, turn right (west) onto Carnation Farm Road, which soon crosses the Snoqualmie River (0.8 mile). In an elbow of the river on the right, the 59-acre Chinook Bend Natural Area—a former pasture successfully restored to native floodplain, riparian, and wetland vegetation—offers some of the same birding possibilities as in similar habitats at Stillwater and elsewhere in the valley. Turn in to parking just west of the bridge, or at a larger lot about 500 yards farther ahead. The imposing Carnation Farm (2.3 miles), once a model dairy farm for “contented cows”, is now the home of Camp Korey, a non-profit organization supporting children with serious medical conditions. Long, narrow Sikes Lake, lying in the valley just below the westernmost farm buildings, is good for ducks in winter. In 0.5 mile, 284th Avenue NE turns off to the right (north). A bridge across Sikes Lake is a fine vantage point. Along this and other valley roads, hay fields saturated by winter rains host flocks of Gadwall, American Wigeon, Mallard, Northern Pintail, Green-winged Teal, and other ducks; Eurasian Wigeon can usually be picked out with a scope. Continue along 284th Avenue as it turns left and morphs into NE 100th Street, a lightly-used road with many places to stop to bird the fields and the river. Turn right (north) onto West Snoqualmie Valley Road NE (1.9 miles). It is imprudent to poke along on this far busier road, but there are a few places where you can safely pull off to scan the valley (swans in winter). At the Snohomish County line in 6.7 miles the name changes to High Bridge Road. Turn right (east) in another 1.9 miles onto Crescent Lake Road and recross the Snoqualmie River. 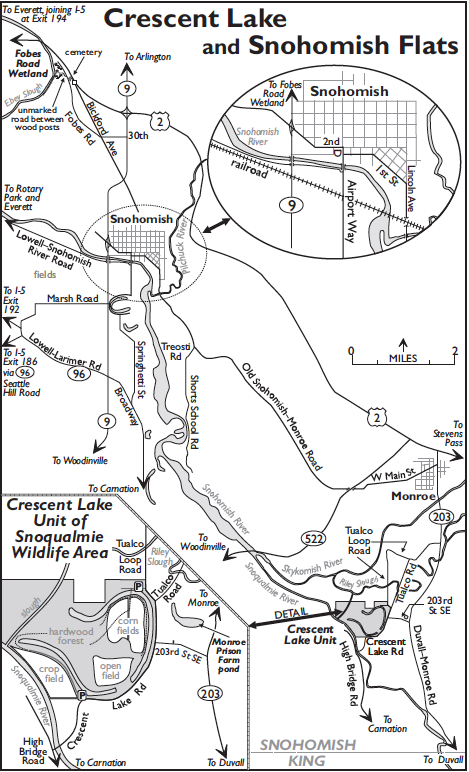 On the left in 0.4 mile from High Bridge Road is the south entrance to the Crescent Lake Unit of the Snoqualmie Wildlife Area (Discover Pass required). The lake is a broken O of water in an old river oxbow, bordered by trees and tangled vegetation. The 360-acre wildlife area includes the land inside the oxbow and west to the Snoqualmie River. About a third of the total area is sharecropped with a part of the grain left standing for wildlife. From the parking lot, a wide track follows the edge of the lake northwestward. Blackberries and other brush provide winter cover for sparrows, and the trees are attractive to woodpeckers, Pine Siskin, and other species (avoid the open fields and lake edges in fall if hunters are present). Farther north, where the lake ends, a path on the right enters an extensive tract of mature maples, alders, willows, and other hardwoods, crisscrossed by a maze of often-muddy trails. This is probably the best chunk of relatively little-disturbed floodplain forest left in the region. In spring and summer, look and listen for Red-breasted Sapsucker, Pacific-slope Flycatcher, Warbling and Red-eyed Vireos, Black-capped Chickadee, Swainson’s Thrush, Purple Finch, and other woodland species. Exiting the parking lot, turn left onto Crescent Lake Road, which follows the lake (walking this stretch gives good viewing) to a pullout on the left in 0.3 mile by a closed gate. Here you can walk into the wildlife area across a filled-in piece of the lake; in summer, expect Green Heron, Willow Flycatcher, Common Yellowthroat, Yellow Warbler, and Bullock’s Oriole. At a three-way junction in 0.3 mile turn right (east) onto 203rd Street SE, which traverses the site of a former state honor farm. On the left, an extensive wet meadow swells in winter into a long, shallow pond—still known to birders as the Monroe Prison Farm Pond—that has attracted well over 100 bird species. A small concrete pad at 0.1 mile from the intersection affords convenient parking. The land is part of a private waterfowl hunting club; please do not trespass. Bird from the pad or on foot elsewhere along the road with a scope. The pond is about 200 yards out. Backtrack to the three-way intersection and turn right onto Tualco Road. Keep straight 0.2 mile and go left onto Tualco Loop Road. The north entrance to the wildlife area is 500 feet ahead on the left. Park in the lot (Discover Pass required) and walk in along the service road that continues the entrance road, turning left to cross the lake on a culvert. You are now in the hole of the doughnut. Dense trees and blackberries on the perimeter screen the lake from view but offer excellent cover for wintering sparrows (Rusty Blackbird in 2015). Go either way around the cornfields. By following paths through the hardwood forest at the west end of the second field you can reach the south parking lot and walk a complete loop. North from the parking lot, Tualco Loop Road crosses Riley Slough, bordered by tall broadleaf trees and blackberries, then continues on through farmland (winter raptors, gulls, blackbird flocks). At the intersection in 1.4 miles go straight ahead onto Tualco Road, then left in 0.7 mile onto SR-203 (Duvall-Monroe Road), which crosses the Skykomish River in another 0.8 mile and enters the city of Monroe. At a traffic light in downtown Monroe in 0.6 mile, turn left onto W Main Street to continue to the Snohomish Flats. (If you go straight and cross the railroad tracks, the next light is at US-2; turn left here to join I-5 at Everett, or right for the Cascades and Stevens Pass, page 404). Headed west through downtown Monroe from SR-203, Main Street passes under SR-522 (1.8 miles), continues west as the Old Snohomish-Monroe Road, and in about 3.5 miles drops down onto the Snohomish Flats. This open farm country is home to a large population of raptors in winter, including one or two Gyrfalcons in recent years. Along the stretch from here to the Pilchuck River bridge (1.9 miles), scan isolated treetops, fencerows, utility poles, and the ground. Make sure you pull safely off the road; shoulders are narrow in most places. A side trip down Treosti Road/Shorts School Road and back can also be productive. Soon after the bridge and a railway underpass, the road—now Lincoln Avenue—enters the old river town of Snohomish. A short way past the city limits, turn left onto First Street. Public restrooms are on the left in six blocks, at Avenue B. In two more blocks, go left (south) at Avenue D across the Snohomish River bridge, following Airport Way south and west to a traffic light at SR-9 (1.1 miles from the bridge). A two-mile-wide band of fields between the river on the north and Lowell-Larimer Road on the south, stretching westward from SR-9 for about five miles, is worth scanning in winter. There are several informal pullouts along both of these roads, and also along Marsh Road, which continues west from the Airport Way/SR-9 intersection to Lowell-Larimer Road at Larimers Corner (2.0 miles). Raptors and swans can be of interest, as can shorebirds when the fields are partially flooded. The Fobes Road Wetland, northwest of Snohomish, is one of the best pieces of accessible wet meadows and freshwater marsh in the river bottoms. Take SR-9 north from Second Street in Snohomish to the intersection with 30th Street/56th Street SE (2.2 miles; traffic light). Turn left (west) to a stop sign at Bickford Avenue (0.4 mile). Continue straight across the intersection onto Fobes Road. Drive past a wooded hillside cemetery on the right (1.3 miles from Bickford). Just ahead, turn off left between two wood posts, drive down an unmarked lane until the way is barred by a gate (about 75 yards), and park without blocking access. Walk around the gate and down the path toward an arm of the river (Ebey Slough). Walk the dike upstream (left) for about half a mile, until the marshy habitat peters out, birding the wetlands (scope desirable) and riparian trees and shrubs. Regular in breeding season are Canada Goose, Wood Duck, Gadwall, Mallard, Cinnamon Teal (a few Blue-winged briefly in May–June), Pied-billed Grebe, Great Blue Heron, Osprey, Bald Eagle, Red-tailed Hawk, Virginia Rail, American Coot, Killdeer, Mourning Dove, Vaux’s Swift, Rufous Hummingbird, Belted Kingfisher, Western Wood-Pewee, Willow Flycatcher, Eastern Kingbird (nests regularly), swallows, Marsh Wren, Common Yellowthroat, Yellow Warbler, Song Sparrow, Red-winged Blackbird, Bullock’s Oriole, Purple Finch, and American Goldfinch. Many other waterbirds and passerines may be found in migration. Before leaving, a walk north to the end of Fobes Road (0.3 mile) and a visit to the cemetery will doubtless produce a few more species, such as Swainson’s Thrush, Cedar Waxwing, and Black-headed Grosbeak, that shun wide-open wetland habitats. Running west from the south end of the Avenue D/Airport Way bridge in Snohomish (but not accessible from SR-9), Lowell-Snohomish River Road lies between the diked river and a high railway embankment, eventually converging with Lowell-Larimer Road at the east edge of Everett. It is possible to get a view of the flats in a few places, but stay off the railroad tracks! In 5.6 miles, on the right, Rotary Park (restrooms) has fine broadleaf riparian habitat along a well-traveled passerine migration corridor. The paved, wheelchair-accessible Lowell Riverfront Trail begins here and continues downstream for about a mile and a half, with a side loop through restored wetland and forest. The next stops are downriver on the Snohomish delta. 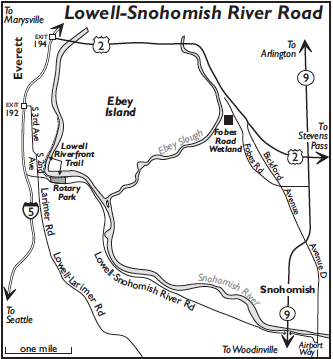 To get there from Lowell-Snohomish River Road, cross the railroad tracks 0.2 mile west of the entrance to Rotary Park; continue west two blocks (name changes to Lenora Street); and turn right onto S Second Avenue (Lowell-Larimer Road), reaching the Exit 192 interchange with I-5 at 41st Street SE in 1 . 2 miles. Or you can travel about five miles westbound on US-2 from the interchange with SR-9 north of Snohomish. In both cases, take I-5 northbound when you reach it. The strategically located Everett sewage ponds function as part of the Snohomish estuary ecosystem, attracting a good number and variety of birds in all seasons. Birders are welcome, but must remain outside the fences. The ponds are reached from Exit 195 on northbound I-5. Turn left at the end of the offramp onto E Marine View Drive. At the interchange in 1.5 miles, turn left for the onramp to SR-529 (Pacific Highway) northbound and cross the Snohomish River. Stay in the right lane and turn right at the first road, 28th Place NE, 0.2 mile from the north end of the bridge, indicated by signs for the marina and for Langus Riverfront Park. Immediately after turning off, turn right again onto 35th Avenue NE. At the next intersection (0.3 mile from SR-529) turn left onto Ross Avenue. Continue past Dagmars Landing (marina), staying right where 12th Street NE branches off in 0.9 mile (do not cross over I-5). Ross Avenue becomes Smith Island Road at this intersection. You soon come to Langus Riverfront Park along the Snohomish River on your right (restrooms). Pass under I-5. The entrance to the wastewater facility is reached in 1.1 miles from 12th. In migration and winter, the ponds may be crowded with freshwater ducks or they may be nearly empty. High tides often drive waterfowl to take refuge here, as does hunting pressure during the open season (October–January). The ponds are large, so if you are careful, the birds will usually swim away from you rather than taking flight. You will not regret toting your scope. Canada Goose, Gadwall, Mallard, Northern Shoveler, and Ruddy Duck are resident. Cinnamon Teal is uncommon spring through fall, along with a very few Blue-winged Teal (May–June). From fall to winter Wood Duck, American Wigeon, Northern Pintail, Green-winged Teal, Canvasback, Ring-necked Duck, both scaups, Bufflehead, Common Goldeneye, Hooded Merganser, and Horned Grebe are present in varying numbers; look carefully also for the odd Eurasian Wigeon, Redhead, Surf Scoter or other sea duck, Barrow’s Goldeneye, or Eared Grebe. The ponds attract many gulls. Glaucous-winged is present all year (common except in summer). Bonaparte’s is common October–November. Ring-billed and California are fairly common to uncommon in migration, uncommon to rare in winter. Herring and Thayer’s can usually be found in winter. Western occurs annually (winter). Ranks of Mew (winter) and other species often line the border of the lagoon. Winter high tides may drive Black-bellied Plover and Dunlin to roost around the pond edges. Directions for returning to I-5 follow the Spencer Island account. Washington Department of Fish and Wildlife, while the southern half is a county park. Most birders visit just this southern part, along a loop trail (not handicap accessible) atop dikes that have been breached in several places, creating tidally influenced wetlands in the interior of the island. Park at the lot 0.3 mile east of the sewage plant entrance, as described above. 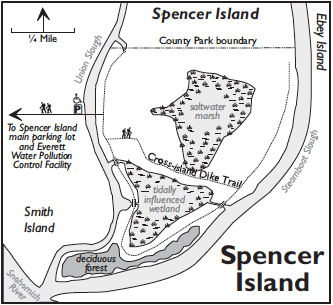 Walk east from the parking lot along the road for 700 yards and cross the old iron bridge to Spencer Island. Take the trail right from the end of the bridge, then walk left onto the dike that crosses the island. A right turn at the far end of this cross-island trail will take you along Steamboat Slough and back around the south end of the island to the iron bridge, with woodland birding opportunities. Wetlands host Virginia Rail year round, nesting Spotted Sandpiper, and modest numbers of other shorebirds in migration—mostly yellowlegs, Least Sandpiper, dowitchers, and Wilson’s Snipe (fall). Tree, Violet-green, Northern Rough-winged, Cliff, and Barn Swallows are abundant (March–August); Purple Martin and Bank Swallow have been recorded. Present in marshlands and bordering woods in nesting season are Vaux’s Swift, Anna’s and Rufous Hummingbirds, Downy, Hairy, and Pileated Woodpeckers, Western Wood-Pewee, Willow Flycatcher, Black-capped Chickadee, Marsh and Bewick’s Wrens, Swainson’s Thrush, Cedar Waxwing, Common Yellowthroat, Yellow Warbler, Black-headed Grosbeak, Red-winged Blackbird, Purple Finch, and American Goldfinch. Raptors at various seasons include Osprey, Bald Eagle, Northern Harrier, Sharp-shinned, Cooper’s, and Red-tailed Hawks, and Peregrine Falcon. In winter, Fox, Song, Lincoln’s, and Golden-crowned Sparrows flock together with Dark-eyed Juncos along slough edges and in brushy places. Eastern Kingbird has nested on the island for many years. On certain June mornings when cold, cloudy weather forces them down from the mountains, hundreds of Black Swifts may forage at eye level over the wetlands and nearby sewage lagoons. To reach I-5 northbound (see Access inset map, page 166), retrace your route past Langus Riverfront Park and the marina to the intersection with 35th. Turn right here and continue 0.3 mile to 28th Place NE, turn left, then immediately right onto SR-529. The northbound I-5 onramp exits left in 1.3 miles, after the highway divides. To return to Everett and I-5 southbound, retrace your route as above, but at the Ross/35th intersection stay left beneath the overpass and follow Frontage Road north. In 0.5 mile a sharp right puts you onto SR-529 southbound and over the Snohomish River bridge to an exit for Marine View Drive, on the right (0.9 mile). Get off here. 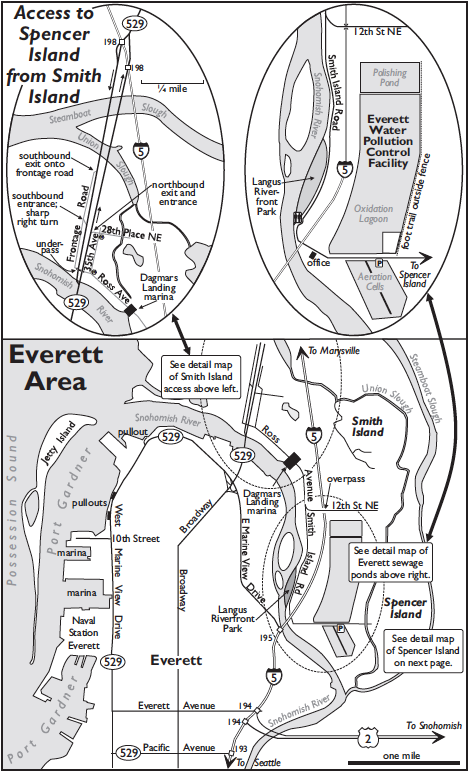 At the traffic light at the end of the offramp loop, you can turn left with SR-529 to the Everett waterfront (see below). A right turn will take you south on Marine View Drive to a southbound I-5 onramp in 1.5 miles. A visit to the Everett waterfront is a good way to round out your day list. (See map on page 166.) Turn left at the aforementioned traffic light and follow SR-529 as it swings west onto Marine View Drive. In 0.9 mile, after descending a bridge across the railroad tracks, turn immediately right to a shoreline access at the mouth of the Snohomish River. Scan for Ospreys (numerous nests on pilings), various waterbirds, and shorebirds on the flats exposed at low tide. In 0.4 mile farther south on W Marine View Drive, a pullout on the right offers great views of the harbor. In a another 0.4 mile, turn right onto 10th Street (signs for Port of Everett) to the public boat launch (restrooms), another good viewing spot. The parking area ($3 fee from May through September) often has a lot of gulls in winter. Purple Martins from the colony across the estuary at Priest Point sometimes forage here. Just offshore to the west is Jetty Island, a dredge-spoil barrier separating Port Gardner—the natural harbor at the river’s mouth—from Possession Sound. The two-mile-long, 200-yard-wide island is served by a passenger ferry operated daily from July 5 through Labor Day. Sandy beaches and a lagoon provide nesting habitat for gulls; shorebird migration beginning in July is another attraction. To reach I-5 northbound, continue south on SR-529 past the marina, then left onto Everett Avenue. For I-5 southbound, go four blocks farther south and turn left onto Pacific Avenue. 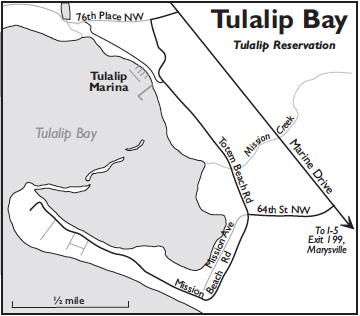 To reach Tulalip Bay, west of Marysville on the Tulalip Indian Reservation, take Exit 199 from I-5 and drive west 4.7 miles on Marine Drive NE (Tulalip Road) to a traffic light at 64th Street NW. Turn left here, then right (0.3 mile) onto Totem Beach Road. In 0.7 mile, park at the Tulalip Marina (restrooms). In winter, scope the sheltered bay for seabirds. White-winged Scoter—comparatively scarce in the southern Salish Sea—is regular here. Black Turnstones rest on rock jetties and log booms; American and Pacific Golden-Plovers and Bar-tailed Godwit have been seen in fall and winter among commoner shorebirds on the distant spit toward the southwest. For closer views of the spit, go back along Totem Beach Road to 64th (reset to 0.0 mile). Continue ahead, following Mission Beach Road onto the peninsula on the south side of the bay, reaching the base of the spit in 1.2 miles. Scope from here and from a couple of other viewpoints on the way in. Birding is best an hour or two on either side of the high-tide mark, when birds are pushed in to roost on the narrowed spit. Note that Marine Beach Road serves private residential property. Shoulders are narrow, and no designated public parking is provided. Make sure to pull off only where possible to do so completely out of traffic and without blocking access to driveways; out of courtesy to residents, remain close to your vehicle and be ready to move it if asked.